“Did you know she’s an author now? !” My friend laid her hand on my arm as she spoke to the other women standing in front of us. Before I could stop myself, I found my head shaking no, as if the information weren’t true, because some part of me still doubted that I deserved that label. After all these years of writing about the work-in-progress woman and claiming our identity in Christ, I honestly still struggle to lay claim to the plans God has for my life and the gifts He has given me. And again later that week, when one of my children called me an author, I was tempted to deny it. I wondered then if Hope for the Hurting Wife had been traditionally published if the label would be easier to accept? Even as the thought came to mind, I knew that wasn’t the heart of the issue. The problem was that I sought the approval of men rather than God – a dangerous place to be. I can’t remember how many times over the years I have confessed my stubborn pride and my desire for worldly achievement to the Lord. Over and over again, I find myself looking for confirmation that I should find in Christ alone. What about you, friend? Do you look for confirmation, too? I found this phrase particularly interesting in the psalms attributed to David, the unlikely boy-crowned-king who spent years without a throne. Even during his rule, He faced frequent plots against his life. The psalmist begged God time and again to preserve his life and reputation. He even had the audacity to point out that God made him king to begin with, so preserving David’s life would be protecting God’s own reputation both among the Israelites and the surrounding nations who were watching the struggle for the throne play out. I decided to do a little study on this phrase and discovered the story of King Hezekiah, who asked God to protect Israel from the Assyrians in a similar way – in order to maintain His own reputation as Israel’s God. Did you catch that? King Hezekiah literally took the letter from his enemy, laid it before the Lord, and asked God to take care of it. Near the end of that same chapter, we read about the God of angel armies, whose angel of the Lord wiped out 185,000 of the enemy and sent King Sennacherib (king of the Assyrians) packing. Now, that’s the God who won’t allow his people to be put to shame! *Jen is a participant in the Amazon Services LLC Associates Program, an affiliate advertising program designed to provide a means for sites to earn advertising fees by advertising and linking to amazon.com. Thank you for helping to support this blog! 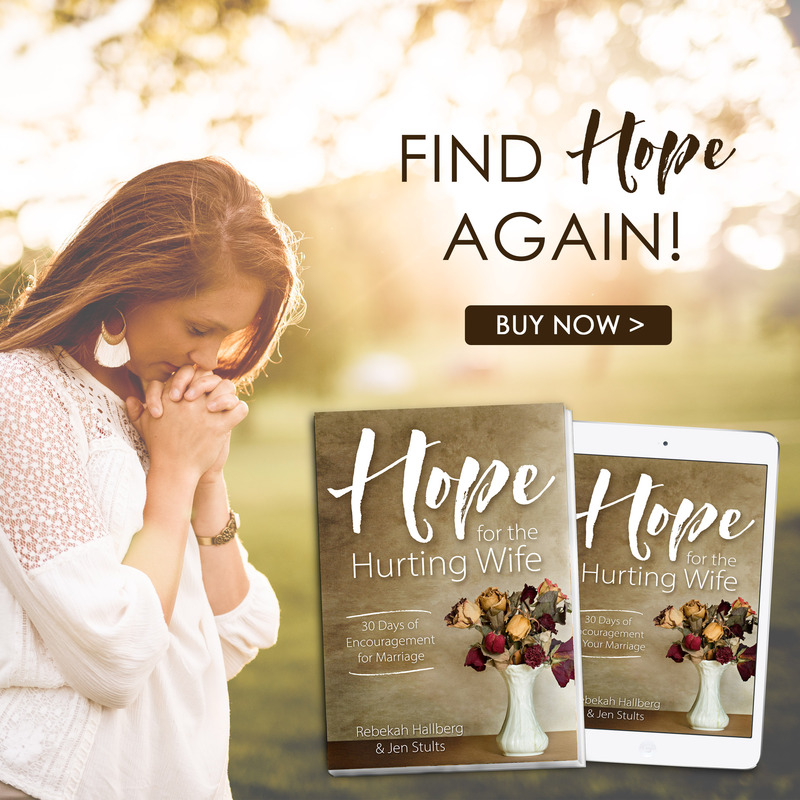 I reminded Him (and myself, too) that neither one of us set out to write Hope for the Hurting Wife, but that we believed we were walking in obedience to Him, following His plans. I reminded him that many people were praying for us, waiting and watching along with us, to see what He would accomplish. What followed was a week or more of seeing hard work and faith in the Lord pay off. We didn’t have a huge marketing team in our corner, just a group of faithful friends. We had no advertising budget, no radio or tv appearances lined up. I think Rebekah would agree that, in fact, we really had no clue what we were doing. He showed up for us in amazing ways! Through a blogging friend, He gave us the information we needed to reach best-seller status in several Amazon Kindle categories. Our little book began to appear as a suggested best-selling new release, meaning Amazon actually did the advertising for us. Looking back, I wish I would have kept better records, but I believe we earned at least four different best-seller “badges,” and we have remained in the top ten in several of our categories for an entire year now. 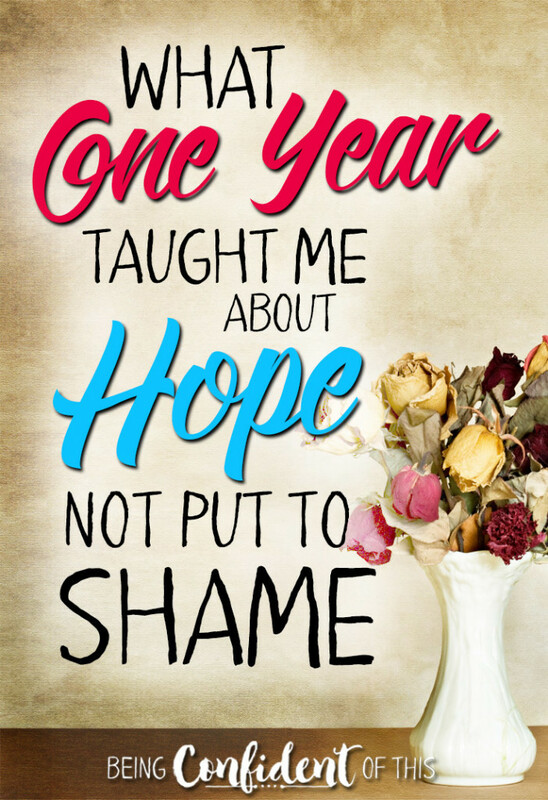 One year later, we have sold hundreds of copies in both paperback and Kindle editions, and we frequently hear from women who found renewed hope because of this book. I tell you these things not to brag, friend, but to show you the might of the God who does not let us be put to shame, praise His holy name! What is it God has asked you to do, friend? Has he asked you to quit your job to pursue His plan for your life? Has He asked you to stay in a difficult marriage just a little longer? Has he asked you to use your spiritual gifts for his glory? Has He asked you to commit to giving up a bad habit or pattern of sin? Whatever He’s asking of you, if He is the author, then you can also trust Him to be the perfecter! That’s not to say that life will go exactly as you imagine, but that as you go, you need not be put to shame when following hard after God. Consider Jim Elliot and the other early missionary martyrs who risked family, finances, and even their very lives to carry the gospel to the Auca people, known head-hunters and warriors of South America. I’m sure some of their friends and family thought they were crazy. And when Jim and the other men died in a savage attack, I wonder if even their wives doubted the vision God had given them. I wonder if their hope was “put to shame” in the eyes of others, too. Yet years later, some of those widows returned to the Auca people to forgive the murderers and bring them the Good News. Many souls have since been saved, praise God. Was their hope put to shame? I think not. The truth is, this world needs more men and women who are willing to be fools for Christ, more Christ-followers willing to risk it all for the sake of Christ. Friend, please don’t be afraid to walk forward in obedience to the Lord. Please don’t fear to do things in His name. The fear of failure is real, I get it. But we serve the God of the universe – let’s get that, too. So we cry out with humble hearts, Lord, let us not be put to shame! 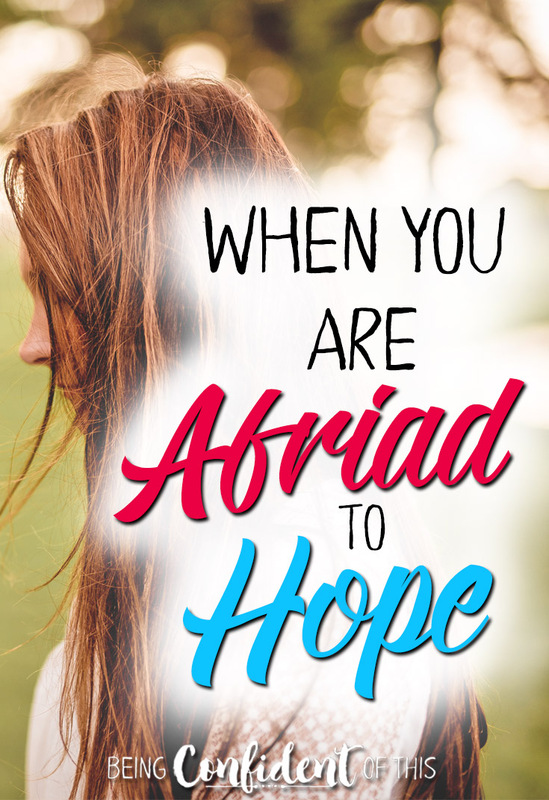 Okay, let me climb down from my soapbox now (I really do get excited about this kind of hope! 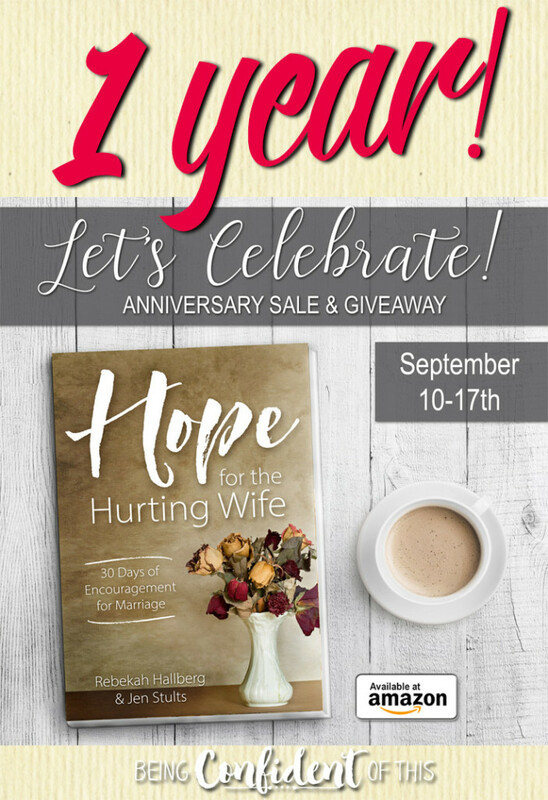 ), and invite you to celebrate the 1 year anniversary of Hope for the Hurting Wife‘s release! 1. We’ve temporarily lowered the price of the print version (nearly half off!!) so that more women can get their hands on this book. If you need it, now’s the time to buy it. If you know a friend or family member who needs it, now’s the time to buy it. If your church has a library and you think it could use a copy, now’s the time…. you get the idea. 2. 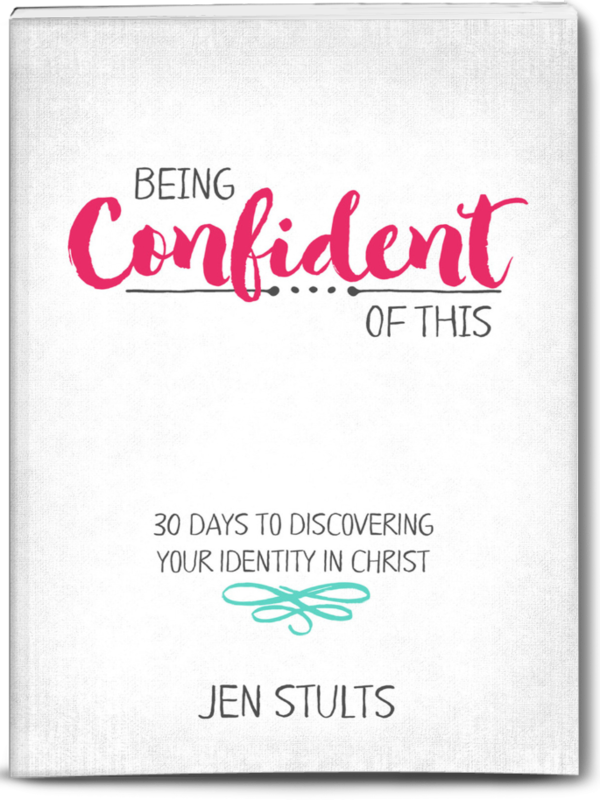 For the next week, you can ENTER TO WIN a copy of our book here at Being Confident of This or over at my co-author’s blog, Sharing Redemption’s Stories. We are each giving away a copy, so between the two of us, there will be TWO winners – woot, woot! Before you go, can I selfishly ask you for a favor? We love, love, love to hear from our readers about how God is using this book in their marriages. Would you leave us a comment, or send us an email, or even better – leave us a review on Amazon or Goodreads, if this book meant something to you? We celebrate each and every one of your remarks!